In the 1993 movie, The Music of Chance (based on the Paul Auster book of the same title), Jim Nashe (Mandy Patinkin) is an ex-fireman who sets off with a sizeable inheritance to explore the US in his new red BMW. He is free of debt and responsibilities. On route, he meets Jack Pozzi (James Spader), a feckless down on his luck gambler. Pozzi cunningly manipulates Nashe to enter a high stakes poker game against two eccentric and wealthy bachelors. Unfortunately, the poker prowess of Nashe and Pozzi is not up to snuff and after running out of money and using his car as collateral, Nashe risks everything on a last blind turn of a card. As luck would have it, he loses and the two become indebted to the cunning bachelors. To pay off the debt, they are indentured into building a “wailing wall” in the meadow behind the bachelors’ mansion, a wall that nobody will ever see. This wall is to be made of stones from the ruins of a fifteenth-century Irish castle, each weighing more than sixty pounds. There are ten thousand stones. It is widely distributed in the Earth’s crust. It is igneous, slowly solidifying from magma. It can contain minerals, like feldspar and quartz, so it is the Superman of stones and is stronger than steel. Granite is everywhere in Dartmoor, including our property walls and most of our house. 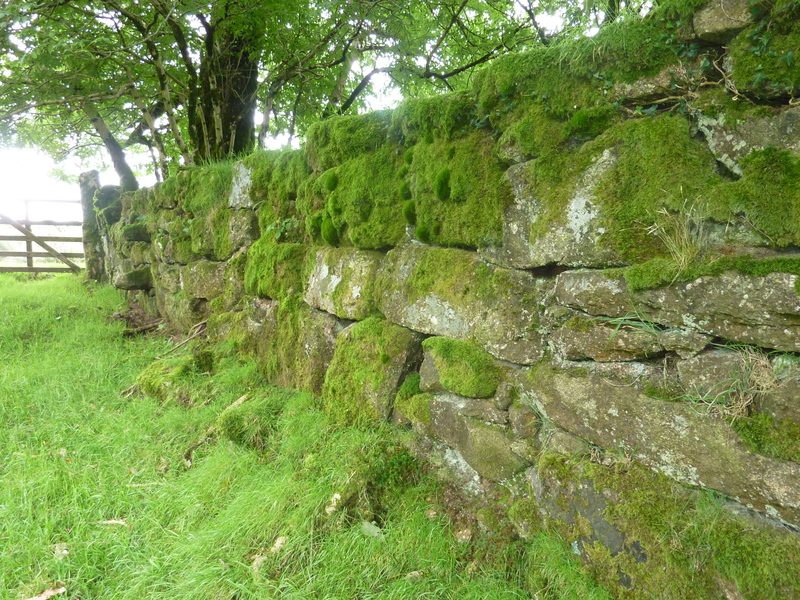 One thing that Dartmoor is not short of is dry stonewalls and there are hundreds of miles of walls across the moor. 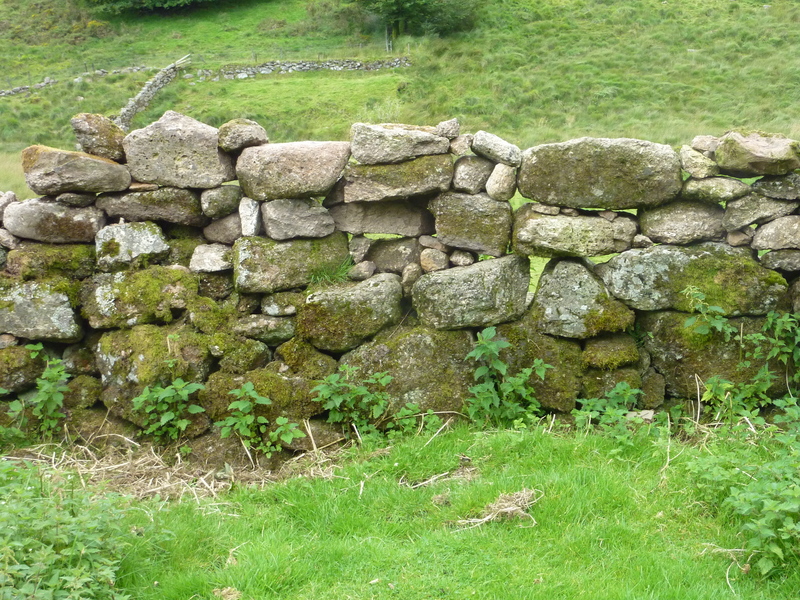 Early farmers enclosed their land by building these sturdy walls. In the 1700’s, a right of any ancient tenement holder (farm) was that upon succession of the farm, the son could enclose a further 8 acres of land. These areas were called “newtakes”. Someone had to build these enclosures and building a wall by piling stones 4 or 5 feet tall without mortar was an invaluable skill. I will attest, it still is. 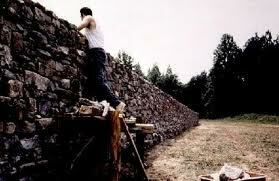 When we met Jim, a local stonewaller, he was repairing the wall along our track for the local farmer. He and his apprentice took the section that had fallen during a storm last year, and in a days work in the pouring rain, recreated a beautiful wall. 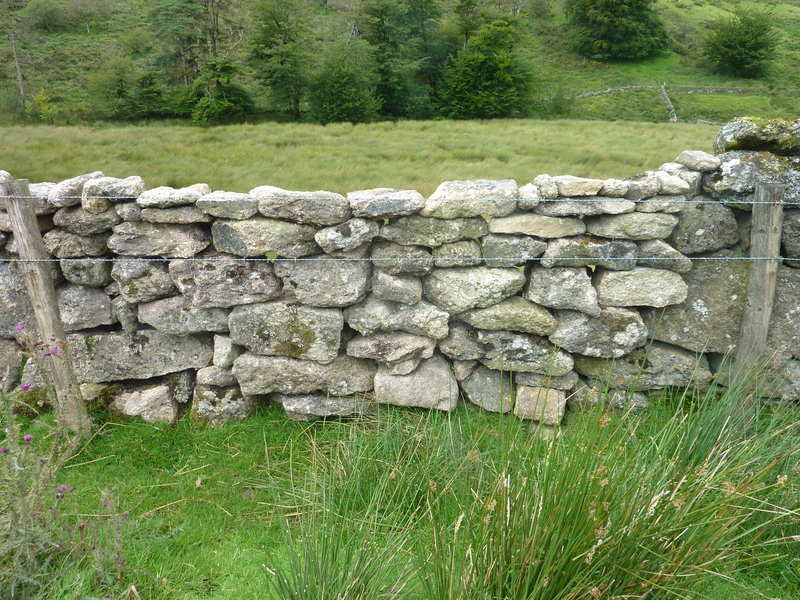 We asked Jim to take a look at some of our walls that needed repair in order to keep the sheep out. This talented man, who earns a living building stonewalls, suggested installing stock proof fencing. The major breaches are in soggy bits of field, and to bring a “digger” to lift the heavy stones into place might result in the digger sinking into the ground. Alternatively, he suggested we keep stacking the stones up as best we can. Bloody hard when we are lifting a 400 pound stone! Marital discord aside, Roger and I have been unable to locate a face. Stones for building walls are everywhere and if the sheep or erosion have knocked them off, they are often buried nearby the remaining wall. Historically, a wall builder wouldn’t break or shape stones, and instead would build the walls with the materials nearby. If needed, some stones would be carried across a distance by sleds or ponies. In later years, many wall builders started using only the large stones and roughly squared them. We have some examples of these in our walls. We also have some stones that have fallen and are sitting nearby, mocking us. Some are impossibly large and heavy and it is difficult to imagine how they were ever lifted into place. Consider The Great Wall in China, Hadrian’s Wall on the Scottish Border, the Irishman’s Wall in Dartmoor, and the walls to our house and fields and the mind begins to boggle. Thankfully, this wall isn’t in need of repair. Look at the size of these stones. It can range in colour and its texture is determined by the rate of cooling. It makes a beautiful countertop. Curling stones have been made of granite since 1750 and weigh between 38 and 44 pounds. Granite is heavy. A cubic foot of granite weighs 168 pounds, compared to the same volume of water, which weighs only 62 pounds. The lintel above the door to the entrance of the house is up 6 feet and is 4’9” x 2’ x 10” (yes, those are imperial standard measurements). I now have a rough idea that this stone could weigh at least 1,330 pounds . People have worked with granite for thousands of years. We’ve used crowbars, gravity, fulcrums, the “one, two, three, lift,” swearing, “third time is a charm,” determination, perseverance, smaller stones, the end-of-the-day-cocktail-motivator, and still our walls are just okay. No faces in the final formation. Nor are there any larger-than-life-squared-off-boulders-not-to-be-moved-for-another-1,000-years back in their place. Yet, we remain undeterred. In constructing the Wailing Wall, Pozzi begins to view the work as an infringement of human rights and nothing short of being a slave. Taking a more philosophical approach, Nashe tries to see it as fifty days of exercise. While hefting our stones into place, I’ve had this exercise thought. Singing Bob Dylan in my head: “They’ll stone you when you’re trying to make a buck. They’ll stone you and then they’ll say good luck. But I would not feel so all alone, Everybody must get stoned.” and still unable to locate a rock’s face, I will let my mind drift to those fabled biceps and shoulders of Linda Hamilton in Terminator 2. Those arms could be mine if I just lifted five more stones before calling it quits. 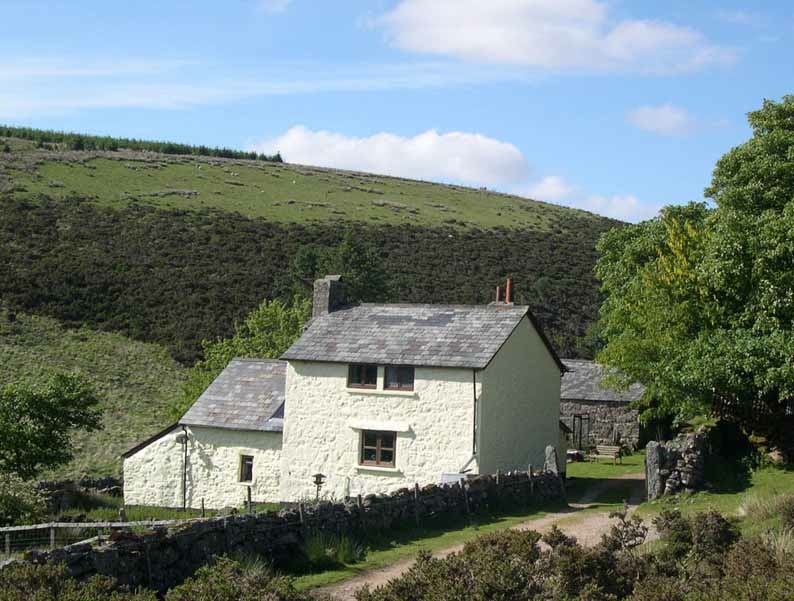 Granite on Dartmoor is not just about walls and houses. The earliest surviving granite structures are the ritualistic and ceremonial monuments from over 4,000 years ago. These include Neolithic stone rows, stone circles, burial chambered tombs and standing stones. Some standing stones may have been simple boundary markers, but when aligned in rows, they may have ceremonial or astronomical purposes. Today’s modern standing stone is most often the memorial to fallen veterans. Both Nelson’s Column and the New London Bridge incorporate Dartmoor granite. Drizzlecombe Complex consists of megalithic stone rows, longstones, over 20 cairns and hut circles. 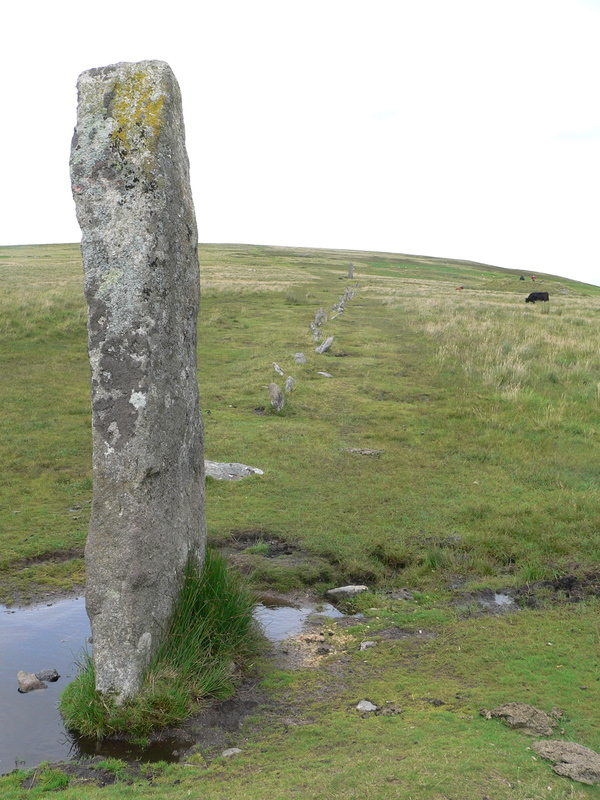 More than a few Dartmoor stories have been inspired by certain natural rock formations, often involving witches. These are not from the Glenda the Good Witch category, as Dartmoor enchantresses are not to be crossed. There is one such story about a coven of witches who sought revenge on a hunter. Bowerman was out with his dogs hunting rabbits when he chased a hare through a gathering of witches practicing magic. Incensed by the interruption, one witch transformed herself into a rare white hare and led Bowerman on another chase across the moors. He continued to pursue the white hare until he collapsed from exhaustion before the other witches. With their collective powers, they gave him a granite coat for warmth while he rested. 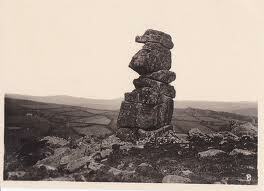 It is said that the hunter remains entombed in the stone formation known as “Bowerman’s Nose”. Notably, these rocks have a face. The Music of Chance takes a darker turn before it concludes, but eventually Nashe completes enough work on the wall to pay off his debt. When I’m not deluding myself about the merits of heavy lifting exercises, I find myself hoping he’ll drive up our bumpy track in that red BMW and lend a hand.